In his ground-breaking article “Perspektive als symbolische Form” Erwin Panofsky argued for the fundamental significance of modes of spatial depiction in the visual arts for cultural history. In line with Panofsky’s approach, changing modes of spatial depiction in Graeco-Roman art have been interpreted as indicators of cultural historical change too, as e.g. in Tonio Hölscher´s important works on changing images of war. This paper adopts a different approach. Differences in the modes of spatial depiction are explained as media phenomena responding to the specificities of picture-genres. Taking the very different treatments of ‘landscape’ in Attic vase-painting (treated as a contrasting comparandum) and in Romano-Campanian wall-painting as a case-study, my aim is to demonstrate how these differences correspond to the respective types of decoration, their specific requirements and their context: Athenian drinking vessels for the symposion and adorned walls as decorum of the Roman upper-class-house. Dans son article pionnier “Perspektive als symbolische Form”, Erwin Panofsky attribue une grande importance aux modes de représentation de l´espace dans les arts figurés pour l´histoire culturelle. Conformément à cette approche, on a aussi voulu voir dans l´évolution des modes de représentation de l´espace dans l´art grec et romain des indicateurs de transformations historico-culturelles (voir par ex. les travaux de Tonio Hölscher sur les images de la guerre). Cet article choisit une approche différente, en faisant le lien entre différents modes de représentation spatiale et différents médiums de l´image (Bildmedien). Par l´exemple du ‘paysage’ dans la peinture murale romaine confronté avec l´analyse du ‘paysage’ dans la peinture sur vases attiques, je voudrais montrer que les différences qui s´y observent correspondent étroitement aux différences structurales existant entre les supports de ces images, leurs contextes, et les impératifs décoratifs qu´elles doivent remplir respectivement pour le symposion et pour une riche maison romaine. 2. Pictorial space and diachronic change: historical interpretation in the wake of Panofsky? Fig. 1: Calydonian boar-hunt on the François Vase, around 580-570 BC. From Furtwängler-Reichhold 1904-1932, pl. 13. Fig. 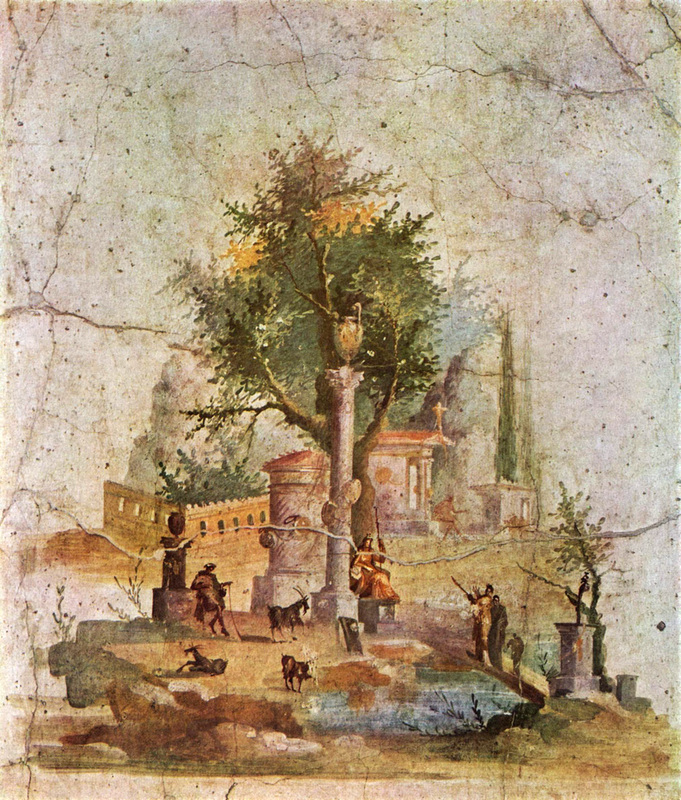 2: Sacro-idyllic landscape from the Villa of Boscotrecase (detail of fig. 4), around 20-10 BC. Naples, Museo Archeologico Nazionale 147501. 1I begin this article with a comparison of two highly incommensurable pictures: the Calydonian boar-hunt on the François Vase (fig. 1),1 an early 6th century Attic wine-mixing vessel (see most recently Torelli 2007, Shapiro et Lezzi-Hafter 2013), and a landscape decorating a wall of the so-called Villa of Agrippa Postumus at Boscotrecase (fig. 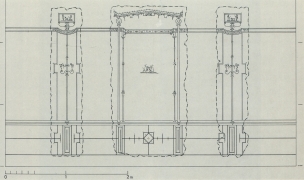 2), a lavish Roman villa of Early Imperial age on the Bay of Naples (Della Corte 1922, Blanckenhagen and Alexander 1962/1990, Peters 1963, p. 69-71, Anderson 1987 and 1987-1988).2 The comparison shall deal with the depiction of landscape, or, in the case of the boar-hunt, with the missing depiction of landscape. Reversing the normal order of enquiry, I will discuss the incommensurability of these pictures only in a second step, in order to reach the main subject of this article: pictorial space as a media phenomenon. In this comparison, ‘landscape’ in Romano-Campanian wall-painting will receive the more extensive treatment, while ‘landscape’ in Attic vase-painting will mainly serve as a contrasting comparandum. The very few examples of Attic vases mentioned here do not, of course, illustrate the depiction of ‘landscape’ in Attic vase-painting in all its complexity, nor can they stand for later developments especially in 4th century Attic and South Italian vase-painting (for a fuller account of ‘landscape’ in Attic vase-painting, I refer to my monograph Dietrich 2010). 2The subject-matter of the boar-hunt, taking place in wild nature where the assembled Greek heroes confront a ferocious boar, in principle seems most suitable for a depiction of landscape. But not a single tree or rock appears on that frieze. On the other hand, the landscape painting in Boscotrecase shows trees, rocks, an uneven ground, water, in short everything what landscapes consist of in modern-age painting. In addition, we see (more allusive than comprehensible) elements of sacral architecture and requisites most characteristic of the so-called sacro-idyllic landscape genre in Romano-Campanian wall-painting (Peters 1963, Silberberg 1980, Leach 1988, p. 197-260, Kotsidu 1998 and 2007, p. 15-28, Hinterhöller 2007a and 2007b, Croisille 2010, p. 92-98, Colpo 2010, p. 167-179, and 2013). 3On the François Vase, not only the iconographic elements of landscape like trees or rocks are missing but also the spatiality of landscape! 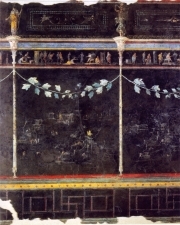 In contrast, the Boscotrecase wall-painting might not follow any strict method of perspective construction like Renaissance painting, but in their effect on the viewer, the pictorial elements are nevertheless shown in depth of space (on the endless discussion about presumed methods of perspective construction in Roman painting, see e.g. Stinson 2011, p. 406-408 [with earlier bibliography on p. 403, note 2]). The shepherd and the two visitors of the pastoral sanctuary are really standing in the landscape. The figures of the boar-hunt for their part are standing in the frieze. The composition of the figures has nothing specifically to do with the landscape where the hunt takes place. It is obviously conditioned by the frieze-shaped pictorial field. 4Finally, one of the main characteristics of landscape-painting as we know it from modern-age art is the relative unimportance of the action or narrative depicted. This surely also applies to the sacro-idyllic landscape. Although acting figures do appear in the picture, it does not matter too much precisely what they are doing. In the boar-hunt, by contrast, the depicted action is obviously the central interest of the picture. 5These very basic differences between the boar-hunt on the François Vase and the sacro-idyllic landscape at Boscotrecase would have been the result of almost any comparison between an outdoor scene in Attic vase-painting and a sacro-idyllic landscape in Romano-Campanian wall-painting. Even though later Attic vase-paintings do show trees and rocks in reasonably large numbers, these motifs are always mere landscape-elements – never do they constitute the main subject of a picture. Moreover, even in images with numerous trees and rocks, these landscape-elements never define the spatiality of the overall figural composition which instead is always conditioned by the form of the picture-field (Dietrich 2010, p. 92-98 and 114-137). As I tried to show, even the mid-5th century introduction of ground-lines replacing the single base-line of the pictorial field did not change this fundamentally. Among the many innovations this brought into Attic vase-painting, the perspective depth does not figure (Dietrich 2010, p. 230-302). In Romano-Campanian wall-painting, the landscape from Boscotrecase is typical of the quite standardized sacro-idyllic landscapes. But other types of landscapes exist besides the sacro-idyllic genre, among them in particular the so-called mythological landscapes, as e.g. 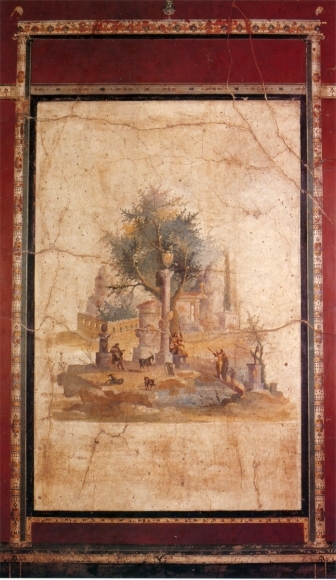 displayed on other walls of the Boscotrecase villa (fig. 10, 11 and 12: see below). 6The contrast between Archaic and Classical Attic vase-painting and Early Imperial Roman wall-painting concerning landscape is thus very clear. According to the usual methodology of historical analysis, we have to conclude that at some time between the 5th century BC and the late 1st century BC, the depiction of landscape in art must have emerged. Some very different monuments standing out by the relative prominence of landscape elements on them would probably let us place the development of landscape in the Hellenistic age. For this, one might cite the so-called tomb of Philip in Vergina from 350-325 BC with its hunting frieze (Andronikos 1984, p. 97-119, Franks 2012), or the Telephos Frieze from Pergamon from 170-160 BC with its rich depictions of landscape (Heilmeyer 1997, p. 99-120, Carroll-Spillecke 1985, p. 18-24, Wegener 1985, p. 56-60). But more fundamentally, this development should then have to be explained and interpreted in terms of cultural history. Though not dealing with landscape specifically, Panofsky has shown us, in his seminal work on perspective in the Renaissance, how an analysis of the changing depiction of space and its significance for cultural history could look like (Panofsky 1927, English translation: Panofsky 1991).3 Classical archaeology has since occasionally tried to adopt such an approach in the study of the development of the depiction of space (closest to Panofsky’s account: Schweitzer 1953). 7In my sense, the best example of a Classical archaeological attempt to load the changing spatiality of pictures with fundamental historical significance is Hölscher’s work on the development of the iconography of battle from Archaic and Classical times on (Hölscher 1973, p. 25-30, 50-84 and 122-169, Hölscher 1987, p. 20-29 [with English translation: Hölscher 2004, p. 23-37], Hölscher 1995, p. 30-36, Hölscher 2003, p. 4-7). The numerous Archaic pictures of fighting hoplites show war as the confrontation of single warriors, in line with aristocratic values as we find them in Homer, where the bravery of single warriors guarantees the victory of the group. These single combats evoke the agonistic societies of the Greek poleis who fought on the battle-ground in a kind of continuation of the athletic agon by other means.4 The famous painting of the Battle of Marathon in the Stoa Poikile on the agora of democratic Athens shows the victory over the Persians as a collective achievement, though still disrupting the battle into many scenes of individual exploits and single warriors fighting: the democratic polis won the war – but the polis is still not more than the sum of its citizens (on the spatial structure of the Marathon painting see also Dietrich 2010, p. 235-240). The Alexander Mosaic,5 copying a painting of the late 4th century, for the first time shows a battle as a complex though not less dramatic movement of troops, where the action and suffering of single warriors make sense only in the collective context. Thus, the picture deploys a spatiality that goes beyond the range of the single figure. This corresponds to the new Hellenistic order of the Greek world where large states take the place of the ‘face-to-face’ societies of discrete poleis. 8This historical interpretation of changes in the spatiality of the imagery of war is doubtless very convincing. For such an approach, it does not really matter whether an image decorates a vase, the walls of a stoa or any other public monument. The spatiality of the picture and the place it concedes to the single figure are categories of description that seemingly apply to any picture, and thus, the question can be addressed without difference to any kind of image. However, as I would like to show in the case of landscape – another subject matter intrinsically linked to the spatiality of the image –, this insensibility of interpretation to the pictorial medium is a very heavy presumption. Indeed, as we shall see presently, the pictorial medium does matter a lot in the case of the Calydonian boar-hunt and the sacro-idyllic landscape compared above. However, the fact that I now start with putting forward the incommensurability of these pictures (i.e. what had been postponed at the beginning of this article) does not imply any general rejection of any attempt at interpreting changing depictions of space in terms of cultural history. My aim is not to replace that cultural-historical view on ancient imagery, but to enrich it with an attention to the specificities of the pictorial medium. Some aspects will show a high affinity to general cultural-historical narratives, others less. 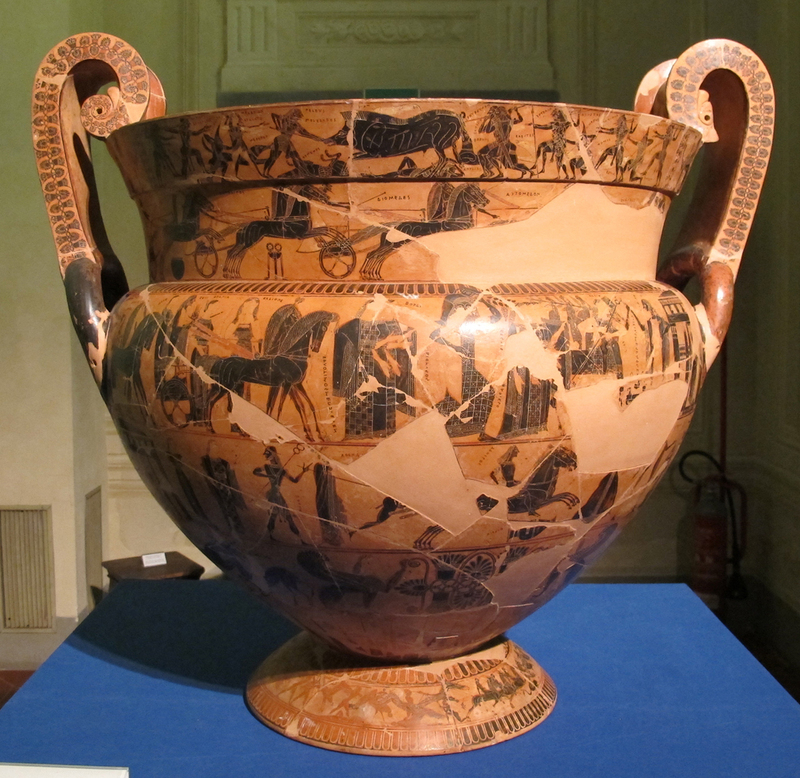 Attic black-figure krater, around 580-570 BC, Florence, Museo Archeologico Nazionale 4209. Fig. 4: Wall decoration in cubiculum 16 of the Villa of Boscotrecase, around 20-10 BC. From Blankenhagen 1990, pl. 21.2. Fig. 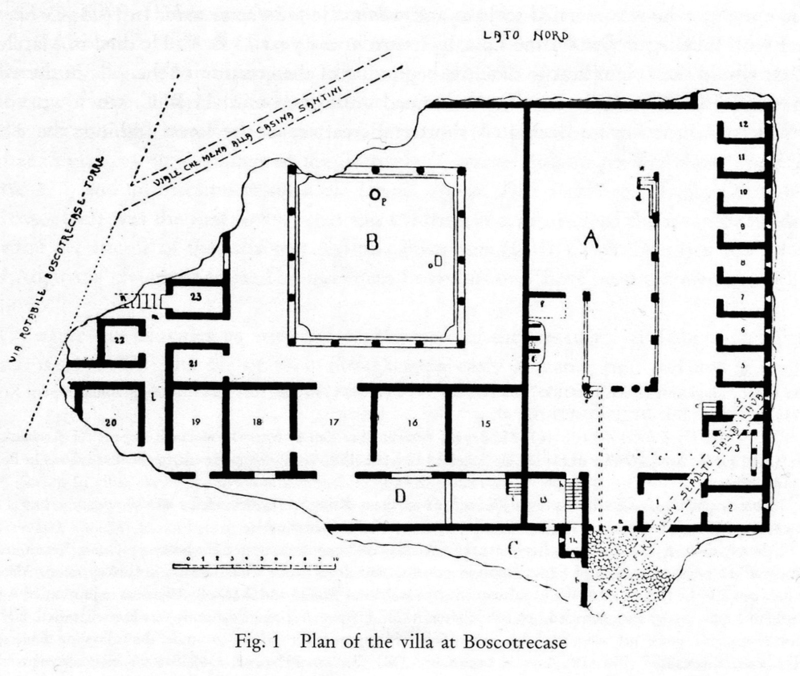 5: Ground plan of the Villa of Boscotrecase. From Blanckenhagen and Alexander 1990, p. 4, fig. 1. 9Let us, thus, try to put these two pictures back into their original context. The boar-hunt on the François Vase decorates, as one of several figural friezes, a large wine-mixing vessel (fig. 3). Even though it was found in an Etruscan tomb, it had been produced in the potters’ quarter of the Archaic city of Athens. The context for which it was primarily destined is the symposion, the male drinking-party of the Athenian leisure-class. Although the krater is a mobile object that even travelled to Etruria, its overall design and sophisticated decoration belongs to a very specific cultural context. 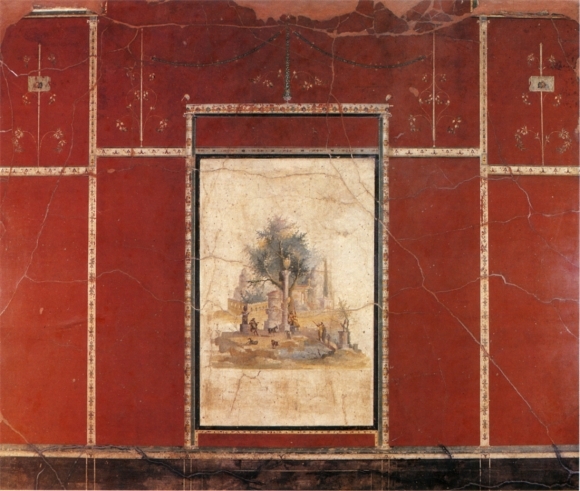 The sacro-idyllic landscape painting, on the other hand, marks the centre of a lavishly decorated wall in one room of a large villa of Early Imperial age (fig. 4 and 5). It can be related to the elite of Rome, for whom the Bay of Naples was a favoured spot for building luxurious country-houses (for a short overview: Pappalardo 2007). 10Concerning that larger cultural context, the difference could not be greater between the ‘face-to-face’ society of Archaic Athens and cosmopolite Imperial Rome. How could this possibly matter to the depiction of landscape? In the agrarian society of the city-state, urban space and the countryside are intrinsically related, the living of most individual families basically depending on agriculture (Osborne 1987, Dietrich 2015). 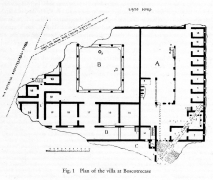 In late Republican and Imperial Rome, agriculture was still the basis of wealth, and the Boscotrecase Villa indeed had an agricultural wing as well (Blanckenhagen and Alexander 1990, p. 1, with note 2). Nevertheless, the Roman ideology of otium and negotium sets the relationship of town and countryside within a totally different framework. The sacro-idyllic landscapes in many respects present a distant world of countryside. This would hardly fits the city-country-symbiosis of the Greek city-state. It seems much more compatible with the stylised otherness of the bucolic rural world in Augustan culture (Zanker 1987, p. 284-290, Leach 1988, 197-260, Blanckenhagen and Alexander 1990, p. 25-26, Deremetz 2009). Conversely, while there is no proper landscape in the Calydonian boar-hunt, nature and wilderness are very much present on the François Vase: it is just concentrated on the Calydonian boar itself, whose ferocity is brought out by its enormous size, by its dead victims and by the large number of hunters who fight it. In that picture, there is no distancing of nature at all, but a direct, physical confrontation. 11Thus, the differences of the two pictures seem to be in full accordance with their different cultural context. 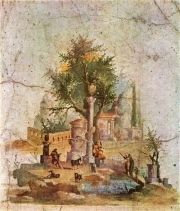 The symbiosis of town and countryside in the Archaic Greek city-state corresponds to the direct confrontation of man and nature in the Calydonian boar-hunt, while the loosening of this symbiosis in Imperial Rome corresponds to the sacro-idyllic landscape showing a distant world of countryside. But we should be careful at this point. From here, the romantic narrative of Greeks living in harmony with nature and Romans, not to say moderns, who lost that natural bond is close by: and precisely because they lost that natural bond, they need to depict nature and landscape, whereas the Greeks could do without them. To quote Schiller: “Sie (the Greeks) empfanden natürlich; wir empfinden das Natürliche” (Schiller 1795, p. 70; see Schnapp 2015, p. 34-35). So, what I just stated in order to match the interpretation of single pictures with the larger cultural context might simply be a disguised reproduction of the traditional explanatory model of landscape-painting and its inexistence among the ancient Greeks (Dietrich 2010, p. 12-15). 12Concerning the more specific cultural context in which both pictures were looked at, the difference between the François Vase and the decorated wall is of a very different kind. Given the multifunctional nature of rooms in the Roman house, it is much more difficult to associate the wall decoration of cubiculum 16 of the Boscotrecase Villa with a cultural context as precise as the symposion for which a krater like the François Vase was made. Some very basic differentiations can nonetheless be made between the contexts for which either picture was made. While the symposion is meant to bring together people of similar social standing, the Roman upper-class house is a space where different social groups mingle, and all its architecture and decoration are aimed at providing the proper contexts/stages for these encounters (ground-breaking: Wallace-Hadrill 1994). The aim of maintaining superiority might be the same – as performative contexts, the symposion and the Roman house nevertheless achieve it by opposite means. The symposion by celebrating the equality of the best, the Roman house by marking social difference. That difference between a painted pot and a painted wall might not have anything to do with the depiction of landscape – but it is crucial for one aspect that the boar-hunt and the sacro-idyllic landscape have in common: they both more or less directly belong to the self-representation of an elite. 13In the case of the Calydonian boar-hunt, the correspondence between the figures depicted on the krater and those around the krater is obvious: the assembled Greek heroes confronting the wild beast are the best among the Greeks, just as the symposiasts looking at the hunt are (or aspire to be) the best among the Athenians. And just as the equality of the hunters and their subsequent competition are highlighted by their strictly parallel display on the frieze, so are the viewers around the krater equal and at the same time competing in the collective drinking party. In the guise of myth, the picture provides a close correspondence to the values of those looking at it. This is not true in the case of the sacro-idyllic landscape in cubiculum 16 of the Boscotrecase Villa. There, the figures in the picture are very much unlike those in the room. In terms of social rank, the people in the room stand above those in the picture. But given the general ‘otherness’ of the pictorial space, that gap is not problematic, in so far as comparison between the figures on the wall (the shepherds) and the people in the room (the dominus and his familiares) is not encouraged at all. Conversely, another comparison is strongly suggested: that between the landscapes on the walls and the real landscape seen from the opening in the south wall of the room (see fig. 5). With the villa built on the slope of Mount Vesuvius, the south door opened up to a kind of terrace with a magnificent view (Leach 1988, p. 255). It is certainly not too far-fetched to relate such a commanding view over the landscape to the idea of dominion. Does this apply to the landscapes on the walls, too? This would probably be too far-fetched indeed. 14Finally, the most obvious difference between the boar-hunt and the sacro-idyllic landscape is the pictures’ material support: a decorated pot in one case and the decorated walls of a room in the other – the pot being an object in space, and the walls enclosing space. The rest of this article will deal with that very basic difference of pictorial media. Fig. 6: Neoclassical painted porcelain (bone china chocolate cup, Staffordshire 1815-20). London, Victoria and Albert Museum 414-1899. 15That pictures on vases or on walls should not be looked at as isolated works of art but have to be studied within their context has long become a commonplace among archaeologists. But which context are we talking about? There surely are many different relevant contexts for a picture: who is looking at the picture? On which occasions? What other pictures are around? Among the many possible contexts of a picture, the basic one of its material support generally receives relatively little attention. In 18th and 19th century Europe, the same kind of landscape may be found on painted porcelain as on canvas. A bone china chocolate cup from 1815-1820 in the Victoria and Albert Museum in London can serve as an example for this (fig. 6). 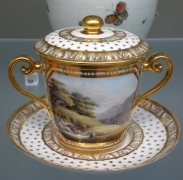 The pastoral scene on the cup, with cows in the foreground on the left and mountains in the background on the right, presents itself just as a framed canvas, opening up a view on a grand landscape going far beyond the tiny dimensions of the fine chocolate cup. Here, the spatiality of the picture does not depend in any way on the dimensions of its material support. In Graeco-Roman visual culture, this is very much not the case, as I would claim. As I tried to show in another context, the landscape elements in Attic images never go beyond the dimensions of the figures. Even the mountain of Sisyphos is depicted as a clearly confined object in space, as seen e.g. on a black-figure amphora in Munich around 510-500.6 Thus, they conform to the spatiality of their material support, the vase, which is too an object in (the viewer’s) space (Dietrich 2010, p. 34-39, Dietrich 2011, p. 296-301).7 Landscapes in Roman wall-painting, on the other hand, go beyond the spatiality of confined objects in space. Indeed, they themselves provide the enclosing space for the objects, architectural structures and figures depicted. As already noted above, the shepherds in the sacro-idyllic landscape painting from Boscotrecase seen in fig. 2 do not stand on the wall like the hunters on the François Vase who stand in the frieze but actually in the landscape. At a first glance, one might interpret this as an eventual emancipation of pictorial space from the spatiality of its material support. However, I would like to suggest another interpretation. By providing the enclosing space for the figures and objects depicted in the picture, the landscape painting still corresponds to the spatiality of its material support, the walls of a room, which provide enclosing space, too – though not for the painted figures in the pictorial space but for the real people in the room. To put it simple: as decorated Attic vases are objects in (the viewer’s) space, the ‘landscapes’ on them are depicted as confined objects too. As decorated walls of a Roman domus enclose (the viewer’s) space, the landscape on them provides enclosing pictorial space too. In both cases, there is thus a correspondence in the spatial structure between the picture and its material support. Fig. 7: Attic black-figure hydria, around 510 BC. London, British Museum B 314. Munich, Museum für Abgüsse Klassischer Bildwerke, Photothek. 16For Attic vase-painting, the correspondence of the landscape to the spatiality of the vase seems rather clear. Not only does ‘landscape’ always stay within the clearly confined dimensions of an object,8 it even conforms itself to the ‘architecture’ of the vase. This is particularly clear where rocks strictly follow the outline of the picture-field’s frame, turning in a right angle at the frame’s corner, as seen on a hydria of the Leagros-group with Geryoneus reclining ‘in his cave’ (fig. 7).9 This ‘cave’ results simply from fitting the border of the picture field with rocks, without creating any other space than the one provided to the figures by the ‘architecture’ of the vase (Dietrich 2010, p. 156-177). In the case of Romano-Campanian wall-painting, the spatial correspondence between the picture and its material ground might be less obvious. But as I would like to show in the remaining part of this article, Romano-Campanian wall-painting develops much of its aesthetic appeal by gravitating around the wall’s spatial quality of enclosing the viewer’s space, alternately challenging and reaffirming that enclosing quality. Fig. 8a: Central panel from the north wall decoration of cubiculum 15. New York, Metropolitan Museum 20.192.1. From Blankenhagen 1990, pl. 5. Fig. 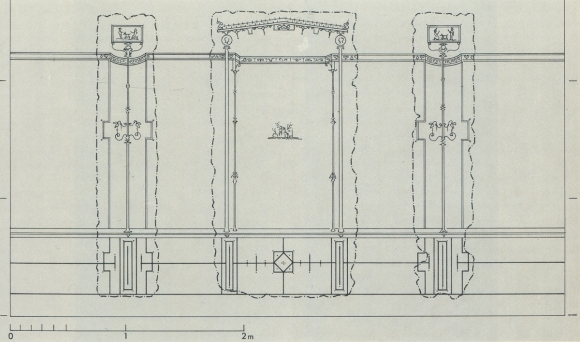 8b: Reconstruction drawing of the wall’s overall decoration scheme. From Blankenhagen 1990, pl. 3.1. Fig. 9: Central part of the north wall of cubiculum 16. 17Let us first turn to the overall decorative schemes of the two well-preserved cubicula 15 and 16 of the Boscotrecase Villa (fig. 8a-b, 4 and 9). The similarities are striking: over a dark monochrome dado, an extremely slender and ‘unreal’ architecture is set in front of a monochrome background either in black or in red. 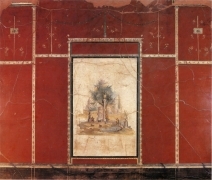 The grand architectural perspectives opening up the walls in earlier second style painting gave way to plain monochrome surfaces that emphasise the wall as a wall, making the Boscotrecase Villa one of the most commonly used examples of third style wall painting in archaeological textbooks. However, in marked contrast to the overall impression of plain surface-decoration, the closure is suddenly broken up in the centre of each wall by a tiny landscape painting opening up to infinite space. On a closer look, such a contrast between surface-decoration and three-dimensionality does not only exist between the overall decoration of the wall and its central picture but is found all over the wall. In fact, what looks like the ornamental stripes of a surface decoration-pattern gains the quality of architectural elements as soon as one follows it with the eye (on switching from a distant to a closer look in cubiculum 16, see also the remarks by Chevillat 2007). The broad stripe on top of the wall’s middle zone in the black cubiculum turns out to be a kind of architrave, the vertical stripes become candelabrum-like columns sustaining that entablature, and the green stripe over the dado becomes the horizontal surface on which these columns stand, thus implying a recession in space of the whole middle zone of the wall; the columns even cast shadows on the ground behind them. Similar observations could be made for the red cubiculum. This ambivalence between ornamental surface-decoration and three-dimensional spatiality is obviously one leading principle of these wall decorations. Fig. 10a: Central mythological landscape painting with Perseus and Andromeda from cubiculum 19 of the Villa of Boscotrecase. New York, Metropolitan Museum 20.192.16. From Blankenhagen 1990, pl. 43. Fig. 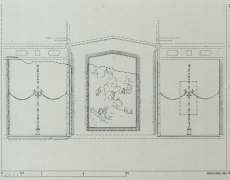 10b: Reconstruction drawing of the wall’s overall decoration scheme. Fig. 11: Landscape paintings from cubicula 16 and 19 put in a row. Naples, Museo Archeologico, and New York, Metropolitan Museum. From Blankenhagen 1990, pl. 24, 30, 31, 42 and 43 (with modifications by P. Petersen). 18What I described here is all well known, and especially the ambiguities intrinsic to Augustan wall painting recently received specific attention (Platt 2007). If third style wall painting is nevertheless generally described as plain surface-decoration in archaeological literature, this is done only in comparison to second style walls, where the element of architectural perspective is much more apparent (see e.g. Zanker 1987, p. 281-283, Ling 1991, p. 52-53, 57, Mielsch 2001, p. 70-73, Croisille 2005, p. 68-71, Barbet 2009, p. 104). But taken for themselves, the painted cubicula of the Boscotrecase Villa do not feature any wall that would not play on the ambiguity between the plain ornamented surface and perspective depth – and the landscapes in the centre of the walls are the focal points of that interplay. As a striking contrast to the surrounding plain surface, the sacro-idyllic landscapes of cubiculum 16 and the mythological landscapes which are found in cubiculum 19 of the same villa function equally well (fig. 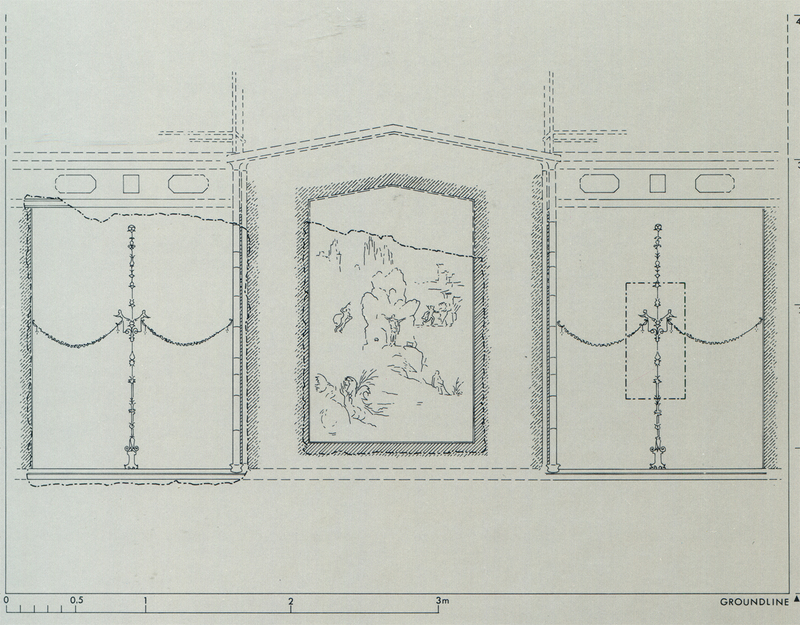 10a-b).10 Here, a similarity in the composition of all the sacro-idyllic landscapes of cubiculum 16 and the mythological landscapes of cubiculum 19 is most telling for these pictures’ function in the overall decorative design scheme and the alternate challenging and reaffirming of the wall’s surface. When put side by side as in fig. 11, it immediately becomes clear that all landscape paintings are organised around a central vertical structure, be it a column, an architectural structure, a tree or a rock. 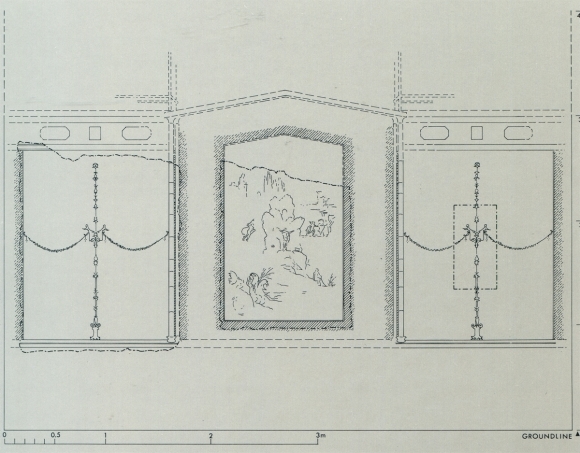 Given that these landscapes are all positioned in the centre of their wall, the vertical structure obviously functions as a central symmetry axis of the overall decorative design.11 Thus, the central (mythological or sacro-idyllic) landscapes are not only breaking through the wall into an infinite pictorial space but at the same time, they are still firmly integrated in the wall decoration’s ornamental pattern. The ambiguity between the plain ornamented surface and perspective depth enters even the landscapes themselves. New York, Metropolitan Museum 20.192.17. From Blankenhagen 1990, pl. 42. Fig. 13: Wall decoration of cubiculum 16 as reconstructed in the museum. 19In the case of the Polyphemus-and-Galatea landscape of cubiculum 19 (fig. 12),12 the similarity to the sacro-idyllic landscapes of cubiculum 16 concerns not only the composition but also some iconographic features such as the column supporting a vase or the statue erected on another column (fig. 13). The cyclops’ island is somehow turned into a sacro-idyllic landscape. Insofar as the world of myth and the sacro-idyllic landscape both present a space characterised by their distance from the viewer’s space, the two landscapes can be assimilated in terms of iconography.13 But as much as these landscapes are withdrawn from the viewer’s space by means of their iconography and by their breaking up the closeness of the wall’s surface, their ‘otherness’ is nonetheless firmly kept within the room and fixed on the wall. This appears in another telling detail of the paintings. The (painted) light in the landscapes always comes from the same direction as the (real) light in the room, i.e. from the opening’s side on the south. The same is true for protruding architectural features in the wall decorations, which throw shadows to the same side (this has, of course, already been observed, e.g. by Peters 1963, p. 71), just as if the same (real) sunlight would light the decorated wall and the landscapes painted on it. This reminds us of the fact that every room’s three landscapes were completed by a fourth landscape: the one that could be seen from the room’s opening (on the relationship between real and painted nature, see Bergmann 2002). 20This parallelism to the real landscape outside the room’s door makes clear to what extent the spatiality of the landscapes painted on the walls communicates with the space decorated by these paintings. The aesthetic appeal of the painted landscapes as a part of the overall wall decoration depends and grows with the friction and ambiguity between the surface of the enclosing wall and the concrete reality of the viewer’s space. Rome, Museo Nazionale Romano 1080. From Croisille 2010, p. 85, fig. 105. 22In a more diachronic perspective, it is worth noting that the emergence of both mythological and sacro-idyllic landscapes in Romano-Campanian wall-painting occurs just when the process of relative enclosure of the walls by the end of the second style begins (on the development of landscape painting, see e.g. Peters 1963, Ling 1991, p. 142-153, Mielsch 2001, p. 179-192, Croisille 2005, p. 204-219, Croisille 2010). This shows how the new emphasis on the wall’s surface in late second and early third style on the one hand, and the even more radical opening of the enclosed space by distancing landscapes on the other hand belong together. The emergence of landscapes on walls, which has been interpreted as a phenomenon typical of the Augustan era and its ‘cultural revolution’ (see especially Zanker 1987, p. 284-290, or more nuanced Leach 1988, p. 197-260), thus presents itself here as the result of a changing decorative strategy involving a new balancing of the alternating challenging and reaffirming of the space-enclosing quality of the walls – and indeed of the enclosed space, too. Fig. 15a: View into room 58 of the House of M. Fabius Rufus in Pompeii (VII 16,22), with fourth style decoration and mythological central picture. From PPM (1997) VII, p. 1066, fig. 238. Fig. 15b: Hercules and a female heroine (detail of fig. 15a). From Lorenz 2008, p. 365, fig. 180b. 24For a proper understanding of that new tendency in the mythological imagery of the Roman house, it is crucial to link it with another new tendency in forth style wall decoration: the new prominence of illusionary three-dimensional architecture (see e.g. Ling 1991, p. 71-72). While the mythological protagonists on the walls come closer to the real figures in the room, mirroring the couple of dominus and matrona, this is counterbalanced on fourth style walls by the more conspicuous breaking up of the enclosing wall-surface through perspective architecture. Thus, the decline of grand landscapes on large central wall-panels must once more be put in the context of an overall change in decorative strategy and the new balancing of central pictures and architectural decoration in the constant interplay of challenging and reaffirming the enclosed space. 25The phenomenon of a more direct correspondence between the figures in the picture and the real figures in the viewer’s space in fourth style mythological imagery exemplified here by room 58 of the Casa di Marcus Fabius Rufus has already been observed in the discussion of the Calydonian boar-hunt on the François Vase: both pictures make no use of the distancing element of landscape. What shall we do with this analogy between those most incommensurable objects? This parallel has, of course, nothing to do with a precise cultural continuity between the Archaic polis of Athens and a small town in Roman Imperial times. Thus, it tells us little to nothing about the history of man’s relationship to nature. But it might point to a specific similarity of the strategies employed by the pictorial media involved. For both pictures and their decorative aims, elements of a deep perspective space proved inappropriate. 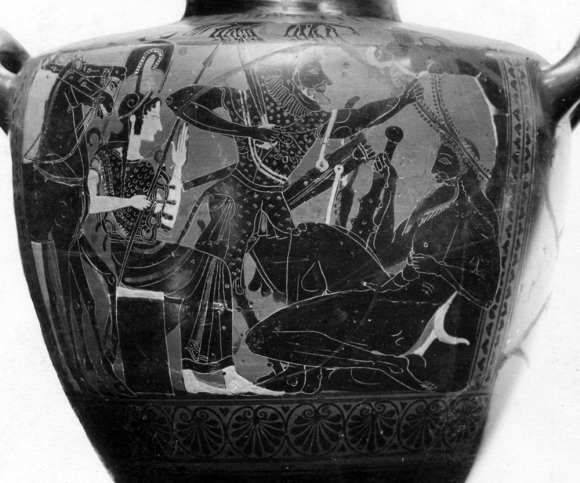 While the black-figure krater as an object in space did not require, in its decoration, any deep perspective space at all, the fourth style decoration of the enclosing space of a room did integrate elements of illusionary perspective space. But within the dynamic development of decorative strategies in Roman wall-painting and its interplay of challenging and reaffirming the enclosed space, deep perspective space had by then moved away from the central mythological pictures towards their architectural and decorative frames. 26Within such an explanatory model based on the strategies of media for explaining the presence or absence of deep perspective space and landscape, the idea of appropriateness – whether a certain decoration does or does not fit its object, context and aims – is much more crucial than the idea of cultural historical change. This idea of decorum is a highly ideologically loaded subject in most pre-modern societies, and certainly in Graeco-Roman culture.18 Of course, the aspect emphasized here does not exclude cultural historical changes! But it should give us warning of any automatism in assuming fundamental cultural historical change where there is diachronic difference. ABV: Beazley J. D. (1956), Attic Black-figure Vase-painters, Oxford. ARV: Beazley J. D. (1963), Attic Red-figure Vase-painters, Oxford [2nd edition]. Para : Beazley J. D. (1971), Paralipomena. Additions to Attic Black-figure Vase-painters and Attic Red-figure Vase-painters, Oxford. PPM: Baldassare I., Lanzillotta T., Salomi S. (1990-2000), Pompei. Pitture e Mosaici, Rome. PPP: Bragantini I., deVos M., Badoni F. P. (1981-1985), Pitture e Pavimenti di Pompei, Rome. Anderson M. L. (1987), “The portrait medaillons of the imperial villa at Boscotrecase”, AJA 91, p. 127-135. 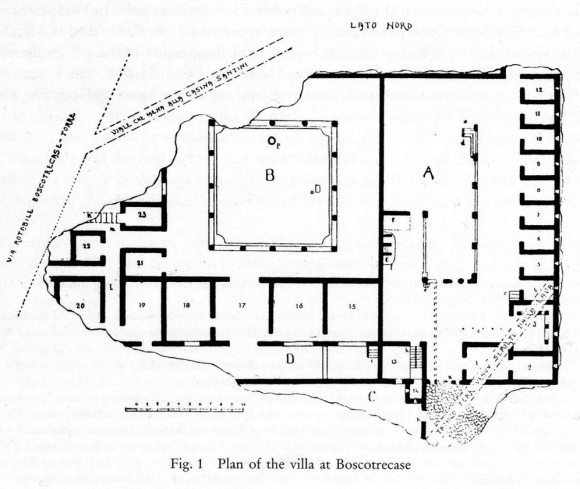 — (1987-1988), “The Imperial villa at Boscotrecase”, BMM, New Series 45, 3, p. 37-56. Andronikos M. (1984), Vergina. The Royal Tombs and the Ancient City, Athens. Barbet A. (2005), La peinture murale romaine, Paris [revised edition, first issue 1985]. Bawden T., Bonatz D., Dietrich N., Fabricius J., Gludovatz K., Muth S., Poiss T. and Werning D. A. (forthcoming), “Beyond Central Perspective(s): Gedanken zum Bildmaterial in Panofskys Perspektive als ‘symbolische Form’ ”. Bergmann B. 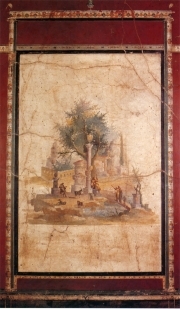 (2002), “Art and Nature in the villa at Oplontis”, JRA Suppl. 47, p. 87-120. Blanckenhagen P. H. von and Alexander C. (1962), The Paintings from Boscotrecase, Heidelberg. 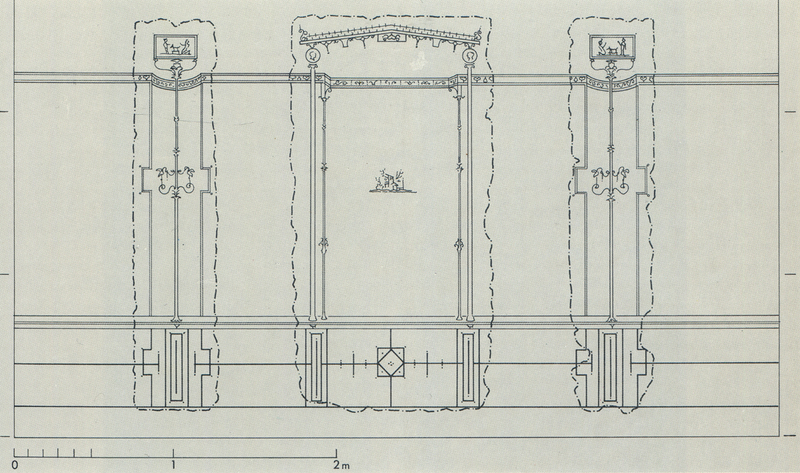 — (1990), The Augustan villa at Boscotrecase, Mainz [revised and uploaded edition of 1962]. Carroll-Spillecke M. (1985), Landscape Depictions in Greek Relief Sculpture, Frankfurt. 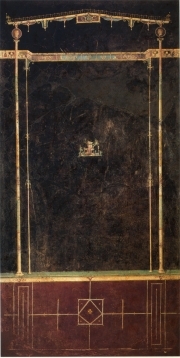 Chevillat L. (2007), “La double distance du regard et les paysages de la ‘chambre rouge’ de la villa de Boscotrecase”, MEFRA 119/1, p. 85-102. Cohen A. (1997), The Alexander Mosaic. Stories of Victory and Defeat, Cambridge. — (2010), Art in the Era of Alexander the Great. Paradigms of Manhood and their Cultural Traditions, Cambridge. Colpo I. (2010), ‘Ruinae … et putres robore trunci’. 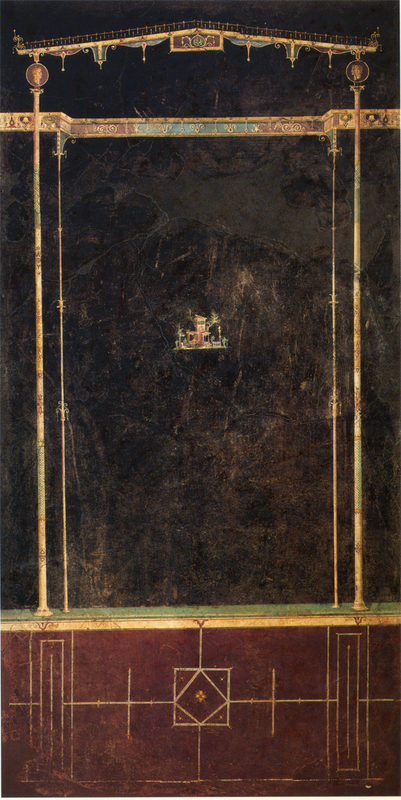 Paesaggi di rovine e rovine nel paesaggio nella pittura romana (I secolo A.C. – I secolo D.C.), Antenor Quaderni 17, Roma. — (2013), “Paysage de ruines dans la peinture romaine (Ier s. av. J.-C. – Ier s. ap. J.-C.)”, in Kaderka K. ed., Les ruines. Entre destruction et construction de l'Antiquité à nos jours, Actes de la journée d'études de l'EA Histara, INHA, 14 octobre 2011, Paris, p. 45-53. Croisille J.-M. (2005), La peinture romaine, Paris. — (2010), Paysages dans la peinture romaine : aux origines du genre pictural, Paris. Della Corte M. (1922), NSA 19, p. 457-78. Deremetz A. (2009), “The Question of the Marvellous in the Georgics of Virgil”, in Hardie P. ed., Paradox and the Marvellous in Augustan Literature and Culture, Oxford, p. 113-125. Dietrich N. (2010), Figur ohne Raum ? Bäume und Felsen in der attischen Vasenmalerei des 6. und 5. Jahrhunderts v. Chr., Image & Context, vol. 7, Berlin. — (2011), “Anthropologie et espace en céramique grecque : du difficile passage de ‘Hestia – Hermès’ aux images”, Mètis N.S. 9, p. 279-308. — (2015), “Lo spazio della natura e lo spazio dell’uomo”, in Chiesa G. S. and Pontrandolfo A. ed., Mito e Natura. 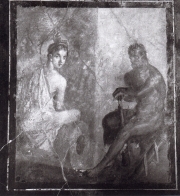 Della Grecia a Pompei, catalogo della mostra, Palazzo Reale, Milano, 31 luglio 2015 - 10 gennaio 2016, Milano, p. 64-71. — (forthcoming), “Figure and Space in Vase Painting and in Architectural Sculpture: On the (Ir-)Relevance of the Medium”, TEMPO. Revista digital de História do departamento e do programa de pós-graduaçao em história da Universidade Federal Flumimense. Franks H. M. (2012), Hunters, Heroes, Kings. The Frieze of Tomb II at Vergina, Princeton. Freytag P. (2009), “Einleitung: Perspektiven auf die 'Symbolische Form'. Eine kritische Relektüre des Panofsky-Aufsatzes”, in Freytag P., Schwitalla A., Schweizer, Y., Lange B., Hiller-Norouzi J. and Dürr F. ed., Raum – Perspektive – Medium. Panofsky und die visuellen Kulturen, Tübingen, p. 1-10. Furtwängler A. and Reichold K. (1904-1932), Griechische Vasenmalerei, Munich. Heilmeyer W.-D. ed. (1997), Der Pergamonaltar. Die neue Präsentation nach der Restaurierung des Telephosfrieses, Berlin. Hinterhöller M. (2007a), “Typologie und stilistische Entwicklung der sakral-idyllischen Landschaftsmalerei in Rom und Kampanien während des zweiten und dritten pompejanischen Stils”, Römische Historische Mitteilungen 49, p. 17-69. — (2007b), “Die gesegnete Landschaft. Zur Bedeutung religions- und naturphilosophischer Konzepte für die sakral-idyllische Landschaftsmalerei von spätrepublikanischer bis augusteischer Zeit”, JÖAI 76, p. 129-169. Hölscher T. (1973), Griechische Historienbilder des 5. und 4. Jahrhunderts v. Chr., Würzburg. — (1987), Römische Bildsprache als semantisches System, Abhandlungen der Heidelberger Akademie der Wissenschaften, philosophisch-historische Klasse, Jahrgang 1987, Abhandlung 2, Heidelberg. — (1995), Formen der Kunst und Formen des Lebens, Ostfildern-Ruit. — (2003), “Images of war in Greece and Rome : between military practice, public memory, and cultural symbolism”, JRS 93, p. 1-17. — (2004), The Language of Images in Roman Art, translated by Snodgrass A. and Künzl-Snodgrass A., with a foreword by Elsner J., Cambridge. — (2009), “Architectural sculpture: messages? Programs? Towards rehabilitationg the notion of ‘decoration’ ”, in Schultz P. and Von den Hoff R. ed., Structure, Image, Ornament: Architectural Sculpture in the Greek World, Proceedings of a conference held at the ASCS, 27-28 November 2004, Oxford, p. 54-67. Kotsidu H. (1998), “Augusteische Sakrallandschaften. Ihre Bedeutung und ihre Rezeption in der bürgerlichen Privatsphäre”, Hephaistos 16, p. 91-105. — (2007), Landschaft im Bild: Naturprojektionen in der antiken Dekorationskunst, Worms. Leach E.W. (1988), The rhetoric of space: literary and artistic representations of landscape in Republican and Augustan Rome, Princeton. Ling R. (1991), Roman Painting, Cambridge. Lorenz K. (2008), Bilder machen Räume. 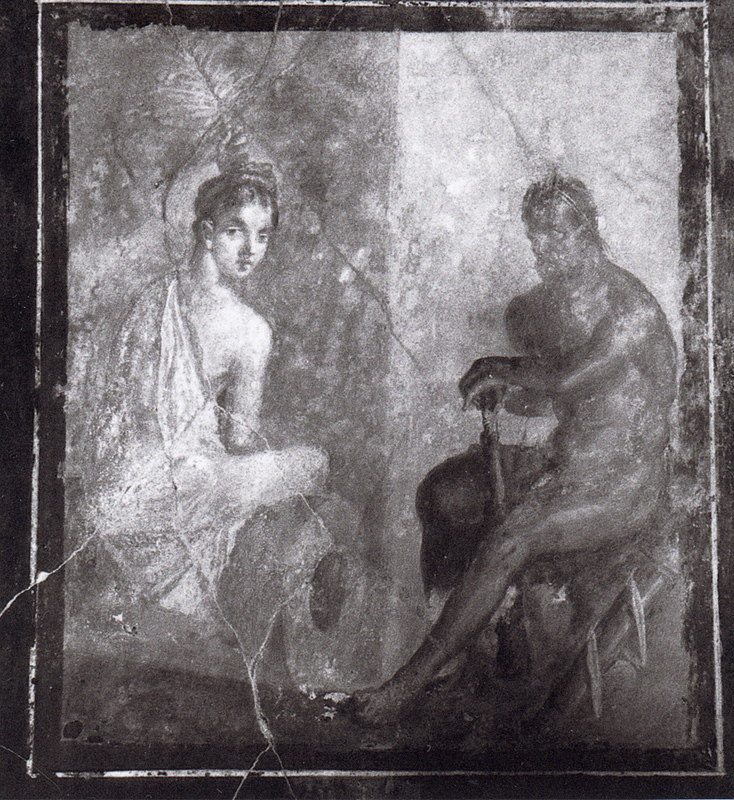 Mythenbilder in pompeianischen Häusern. Image & Context 5, Berlin. Marconi, C. (2004), “Kosmos: The imagery of the Greek Temple”, Res: Anthropology and Aesthetics 45, p. 211-224. Mols S. and Moormann E. M. (2008), La villa della Farnesina. Le pitture, Roma. Mielsch H. (2001), Römische Wandmalerei, Darmstadt. Muth S. (2008), Gewalt im Bild. Das Phänomen der medialen Gewalt im Athen des 6. und 5. Jahrhunderts v. Chr., Image & Context 1, Berlin. Osborne R. (1987), Classical Landscape with Figures. The Ancient Greek City and its Countryside, London. Panofsky E. (1927), “Die Perspektive als ‘symbolische Form’ ”, in Vorträge der Bibliothek Warburg 1924-1925, Leipzig, p. 258-330. — (1991), “Perspective as Symbolic Form”, translated by C.S. Wood, New York. Pappalardo U. (2007), “Die römischen Villen am Golf von Neapel”, in Aßkamp R., Brouwer M., Christiansen J., Kenzler H. and Wamser L. ed., Luxus und Dekadenz. Römisches Leben am Golf von Neapel, Expo Haltern am See, Mainz, p. 17-28. Peters W. J. T. (1963), Landscape in Romano-Campanian Mural Painting, Assen. 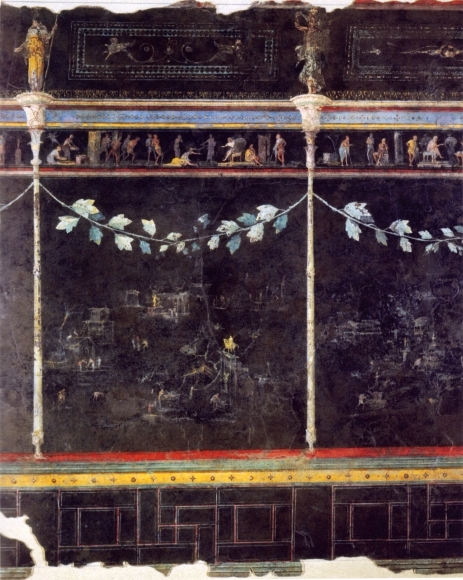 Platt V. (2009), “Where the Wild Things Are: Locating the Marvellous in Augustan Wall Painting”, in Hardie P. ed., Paradox and the Marvellous in Augustan Literature and Culture, Oxford, p. 41-74. Schiller F. (1795), Über naïve und sentimentalische Dichtung, Die Horen, vol. III, Tübingen. Schnapp A. 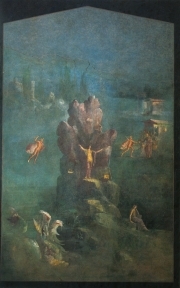 (2015), “La rappresentazione della natura nell´arte greca”, in Chiesa G. S. and Pontrandolfo A. ed., Mito e Natura. Della Grecia a Pompei, catalogo della mostra, Palazzo Reale, Milano, 31 luglio 2015 - 10 gennaio 2016, Milano, p. 24-35. Schweitzer B. (1953), Vom Sinn der Perspektive, Tübingen. Shapiro H. A. and Lezzi-Hafter A. ed. (2013), The François Vase, Kilchberg. Silberberg S. R. (1980), A Corpus of the sacral-idyllic Landscape Paintings in Roman Art, Los Angeles. Stinson P. (2011), “Perspective Systems in Roman Second Style Wall Painting”, AJA 115, p. 403-426. Thaliath B. (2005), Perspektivierung als Modalität der Symbolisierung. Erwin Panofskys Unternehmung zur Ausweitung und Präzisierung des Symbolisierungsprozesses in der Philosophie der symbolischen Formen von Ernst Cassirer, Würzburg. Torelli M. (2007), Le strategie di Kleitias. Composizione e programma figurativo del vaso François, Milano. Vernant J.-P. ed. (1968), Problèmes de la guerre en Grèce ancienne, Paris. Wallace-Hadrill A. (1994), Houses and Society in Pompeii and Herculaneum, Princeton. Wegener S. (1985), Funktion und Bedeutung landschaftlicher Elemente in der griechischen Reliefkunst archaischer bis hellenistischer Zeit, Frankfurt. Zanker P. (1987), Augustus und die Macht der Bilder, Munich. 1 Florence, Museo Archeologico 4209; ABV 76.1, 682, Para 29: Klitias (painter); around 580-570; BA 300000. 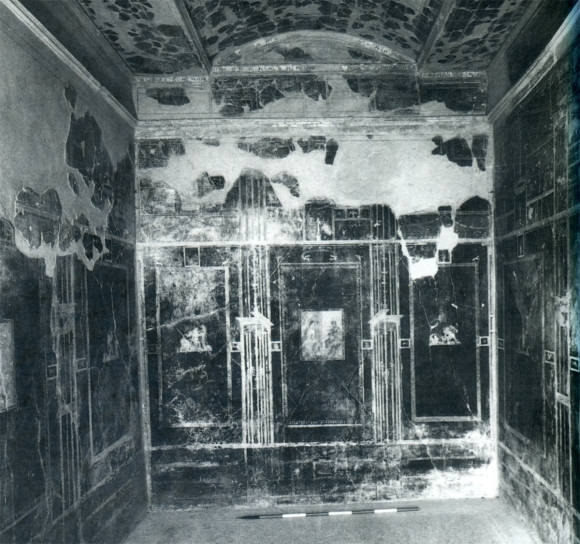 2 The paintings of this villa were excavated in 1903-1905 and roughly published by Della Corte in 1922, but covered again by an eruption of Mount Vesuvius in 1906. They are now displayed in the Museo Archeologico Nazionale in Naples (the red cubiculum 16) and the Metropolitan Museum in New York (the black cubiculum 15 and the mythological cubiculum 19). 3 Panofsky’s article has since been intensely discussed in the field of art-history. See e.g. the introduction to Panofsky 1991 (by C. S. Wood 1991), p. 7-24; Thaliath 2005; Freytag 2009. For a new approach to Panofsky from the perspective of Classical and Medieval studies, see Bawden (forthcoming). 4 Here, Hölscher’s thinking is obviously influenced by French scholarship of the 1960s and 1970s. See e.g. the volume edited by Vernant 1968, especially the articles of Detienne and Vidal-Naquet. On combat scenes in Attic vase-painting, see now the detailed study by Muth 2008, suggesting a wholly new understanding of these iconographies of violence. 5 Naples, Museo Archeologico Nazionale 10020; for a short review of the vast bibliography on the Alexander Mosaic, see Cohen 1997, p. 13-23. For a more recent bibliography, see Cohen 2010, p. 163, note 4. 6 Munich, Antikensammlung 1549; ABV 383.12, Para 168; CVA Munich IX, pl. 12.3, 15.1-2, 17.5; BA 302405. 7 Similar things can be said for landscape elements in Greek architectural sculpture, as exemplified by the small ‘segment of sea’ from which Helios emerges in the Parthenon east pediment: see Dietrich (forthcoming). 8 When in later developments of Attic and South Italian vase-painting from the end of 5th century and especially in 4th century, the painters start to depict whole architectures such as aediculae (in still strongly diminished scale, but often as an isolated element not conforming itself to the ‘architecture’ of the vase), the situation becomes more complex and would deserve a more in-depth analysis, which cannot be provided here. 9 London, British Museum B 314; ABV 360.2, Para 161: Leagros Group; CVA London, British Museum VI, pl. 79.3, 81.4; BA 301997. 10 New York, Metropolitan Museum 20.192.16; for a detailed description and commentary, see Blanckenhagen and Alexander 1990, p. 33-40. On third style paintings of Perseus and Andromeda in general, see Lorenz 2008, p. 126-131. 11 This is a general trait of third style landscapes: see e.g. Croisille 2005, p. 207-208. Another famous context where we encounter such landscapes that are composed around a central vertical item is the late second/early third style Casa di Livia. See Croisille 2010, p. 77-81. 12 New York, Metropolitan Museum 20.192.17. For a detailed description and commentary, see Blanckenhagen and Alexander 1990, p. 28-33. 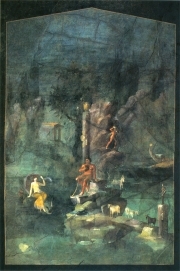 13 The mingling of elements of mythological and sacro-idyllic landscape painting is rather typical. Again, the Casa di Livia would be another good example (see above, note 10). 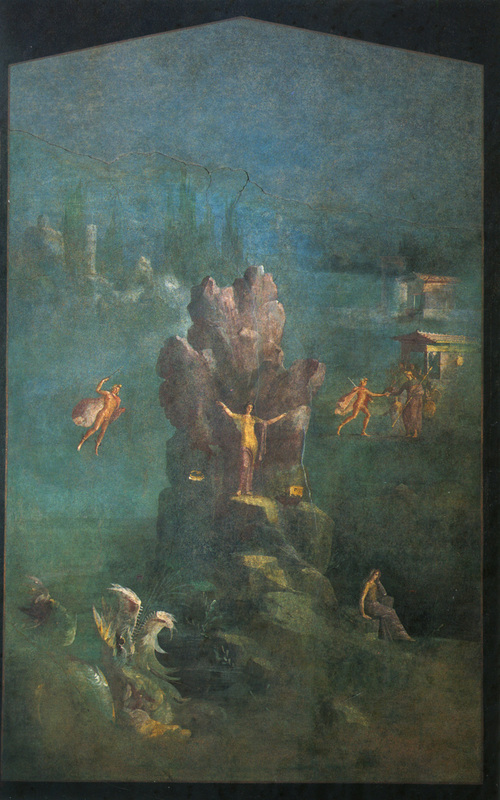 14 On the landscape paintings of the Villa Farnesina, see Croisille 2010, p. 81-86. For excellent plates, see Mols and Moormann 2008. On the wall decoration of the Villa Farnesina, see also the most stimulating article by Platt (2007). 15 Again, the Casa di Livia with its famous yellow frieze provides a good example (Croisille 2010, p. 80-81). 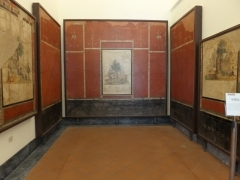 Other well-known examples are the yellow panels from the villa at Oplontis or the red friezes from the villa at Boscoreale. 16 PPP III 271; PPM VII 1065, fig. 236. On the house and its mythological imagery, see Lorenz 2008, 361-368 (with further literature on p. 595-596 [cat. no. K 60]). 17 On the complex relationships between the mythological figures on the walls and the dominus and matrona, changing between affirmation and compensation, and their diachronic development, see the ground-breaking study by Lorenz (2008) on which the present argument also rests. 18 For the decoration of the Roman house, the importance of appropriateness and decorum has been brought out in the seminal study by Wallace-Hadrill 1994. For Archaic and Classical Greece, appropriate decoration – linked to the Greek concept of kosmos – has recently attracted increased attention in the area of architectural sculpture; see Marconi 2004 and Hölscher 2009. Les Cahiers « Mondes Anciens » sont mis à disposition selon les termes de la licence Creative Commons Attribution - Pas d'Utilisation Commerciale - Pas de Modification 4.0 International.